The first is Emerald Express(31015), a creator three in one set from 2014. With six wheels and a green and red, almost Christmas like colour scheme, you may be forgiven for thinking it was intended to be a prototype for the holiday train. One of the alternative builds is for a carriage in similar livery. Our next train to consider is the Holiday train from 2016. 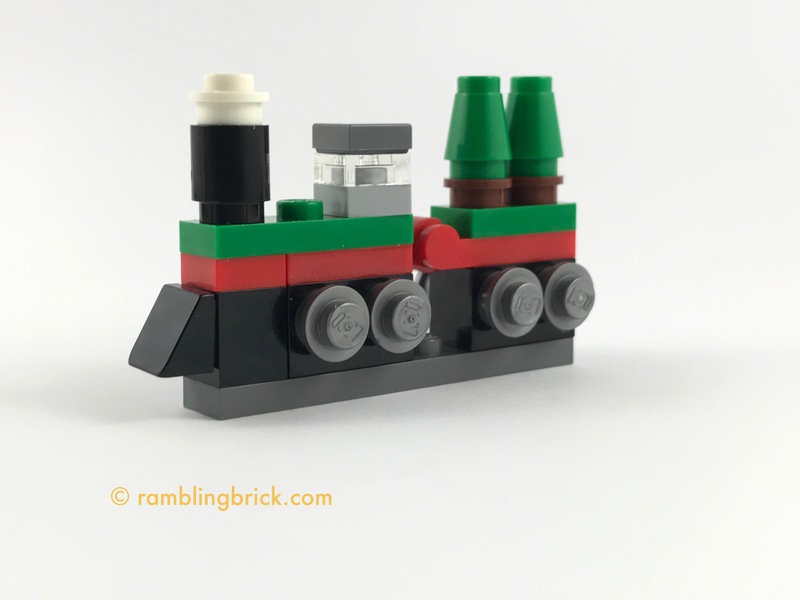 This minifigure scale train is transporting a Christmas tree that spins as the train moves. Based on the color scheme, I presume that our micro build of the day is a micro scale version of the Emerald Express. Rather than a coal filled tender however, it appears to be transporting a couple of Christmas trees. Once again reminding us of the Holiday train. This is a fantastic micro representation of a couple of trains presented in other scales in recent years. It’s simplicity is refreshing and you exactly what is supposed to be… which, after some of the brick built animals, is a little refreshing.